Drea’s research, published online in the October issue of Animal Behavior, shows that social carnivores like spotted hyenas that hunt in packs may be good models for investigating cooperative problem solving and the evolution of social intelligence. She performed these experiments in the mid-1990s but struggled to find a journal that was interested in non-primate social cognition. Filed under: Animal Behavior, Biology, Canines | Tagged: Canines |	Comments Off on Why Do Dogs Bark? Science Daily has an interesting look at recent research into why dog’s look guilty from time to time. 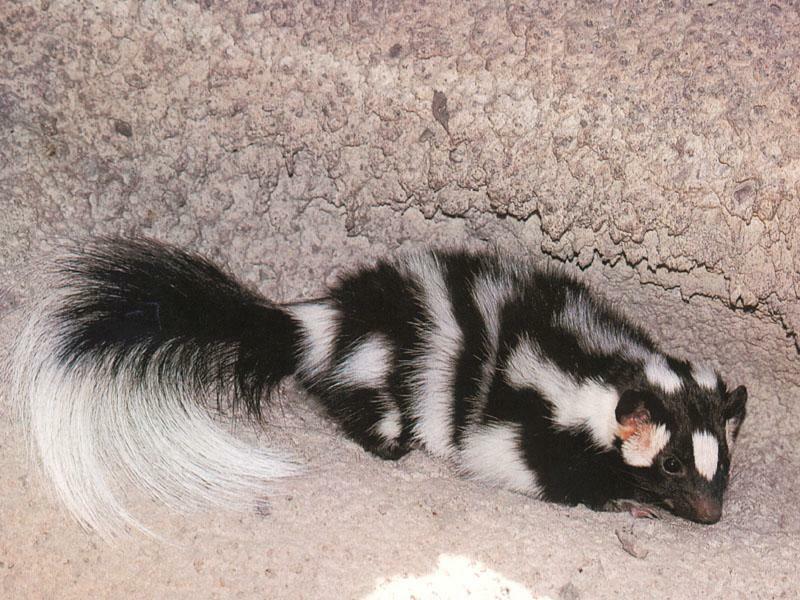 The above is a spotted skunk. Years ago when I was in junior high I was incredibly truant and got thrown into a minimum security juvenile institution. In the meantime, my oldest sister had started hanging around with a lady who taught a continuing ed course on animals and animal behavior. Because of that we had amassed quite a collection of animals – most of which are now ileagal (something I agree with). They all came from other people who had gone out and bought the cute furry animal – then when it became mature and started acting like a wild animal they started looking for ways to get rid of them. WHich is how we ended up with them. I was woken up around 3:30 by the night attendent. He just kept babeling aboput how he had opened the door to get some fresh air and “IT” had walked in and climbed into a trash can. He knew I had some experience with wild animals so he needed me to get “IT” out of the “cottage”. So I got up and went to take a look. Turns out “IT” was a spotted skunk. After finding a lid and putting it on the trash can I carried the trashcan outside about 100 feet from the cottage. Then I slowly tipped the trash can over and took off the lid. After retiring to a “safe” distance I turned to look and see what would happen. After about a minute the skunk slowly walked out of the trash can and walked into the surrounding woods. The above is a striped skunk. Several years latter I was working for the Humane Society (a big mistake as I refused to euthanise the dogs and cats). One of the guys I worked with had a pet skunk he was trying to get rid of, so I aggreed to take. It had been descented. It was a female striped skunk the guy had named Tinkerbell. First thing I did was change her name to Raison (because she looked like a giant raison). The second thing I did was put her on a diet because she was extremely overweight. She was quite tame and we used to let her out of her cage to run around (as a matter of fact she spent considerably more time out of her cage than in). 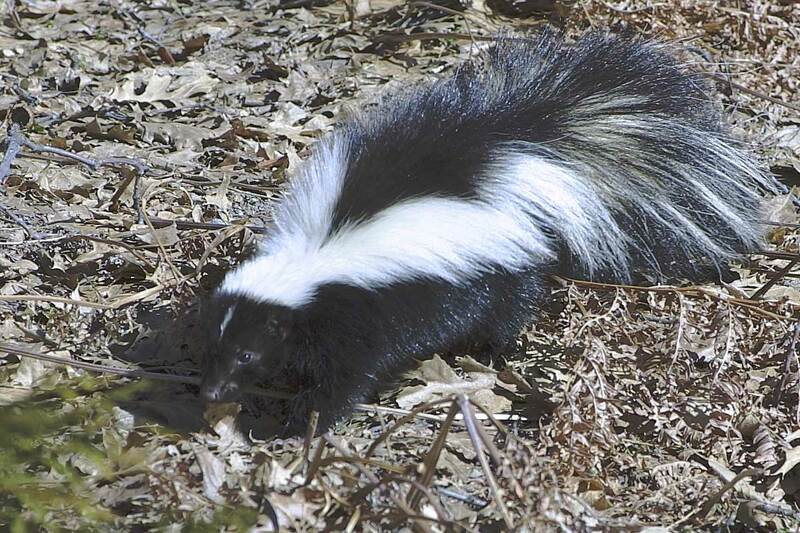 Occasionally we would “forget” to warn visitors that we had a skunk and on several occasions we had people run from the house when they saw Raison. Years later I moved into an apartment that wouldn’t let me keep the skunk so I gave her to my brother-in=law. She lived for quite a while after that. I think she was about 12 or 13 years old when she passed away. Normally, wild animals do not make good pets and I, personally, am against having wild animals as pets but his is one animal I was glad to share my house with. 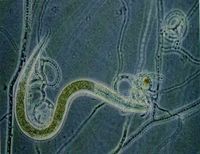 Some fungi are parasitic, as you can see from the above photo. 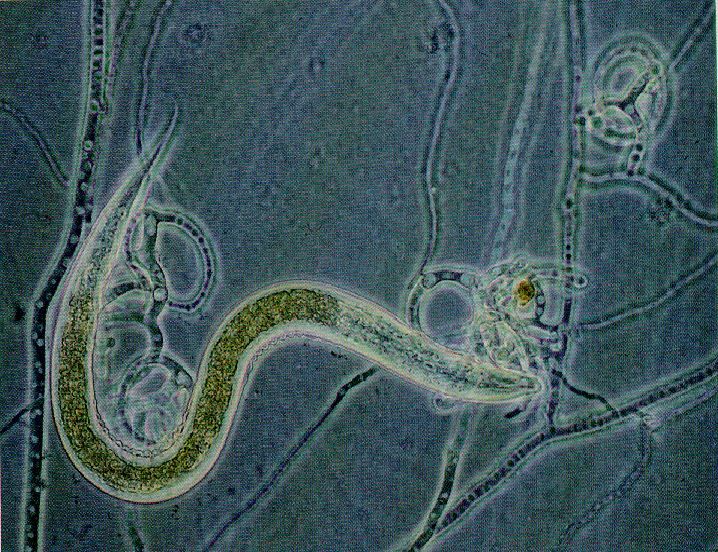 A fungi has trapped a nematode. Most fungi feed on dead organic matter (and are not photsynthetic).